HOW TO USE: Read the Medication Guide and, if available, the Patient Information Leaflet provided by your pharmacist before you start taking topiramate and each time you get a refill. If you have any questions, ask your doctor or pharmacist. Take this medication by mouth with or without food as directed by your doctor, usually twice daily. You may swallow this medication whole, or you may open the capsule and sprinkle the contents on a teaspoonful of soft food (such as applesauce, yogurt). Swallow the drug/food mixture right away. Do not chew the mixture. Do not prepare the mixture ahead of time for later use. Drink some liquid after swallowing the mixture to make sure all of the drug is swallowed. To prevent kidney stones from forming, drink plenty of liquids while taking this medication unless your doctor instructs you otherwise. Dosage is based on your medical condition and response to treatment. For children, the dosage is also based on weight. Your doctor will gradually increase your dose to reduce your risk of side effects. 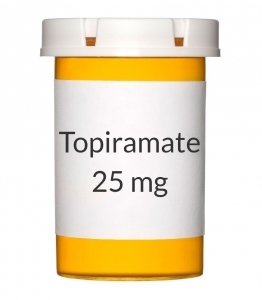 For some conditions, you may start treatment with topiramate once daily at bedtime and slowly increase your dose to twice a day. It may take several weeks or months to reach the best dose for you and to get the full benefit from this medication. Take this medication regularly to get the most benefit from it. To help you remember, take it at the same times each day. Do not stop taking this medication without consulting your doctor. Some conditions may become worse when this drug is suddenly stopped. Your dose may need to be gradually decreased. Tell your doctor if your condition persists or if it worsens. STORAGE: Store in a tightly closed container, at or below room temperature, away from light and moisture. Store in a cool, dry place. Do not store in the bathroom. Keep all medications away from children and pets. Do not flush medications down the toilet or pour them into a drain unless instructed to do so. Properly discard this product when it is expired or no longer needed. Consult your pharmacist or local waste disposal company.